Wayne Rooney and Anthony Martial scored on their returns to the side as Manchester United improved their hopes of a top-four Premier League finish with a 2-0 win at Burnley on Sunday. The convincing victory — United made light of the season-ending injury to top-scorer Zlatan Ibrahimovic — sets up an intriguing Manchester derby visit to City, now just one point above United, on Thursday. Martial’s strike in particular was a perfect response from the French international, whose form had been criticised by boss Jose Mourinho this week, even if it costs his current club £8.3 million (10 million euros) in a bonus payment to his former club Monaco. Martial responded to those recent public criticisms by starting, and finishing, a goal of devastating pace and simplicity after 21 minutes. Having dispossessed Joey Barton inside his own half, the Frenchman initiated the counter attack with a sprint and pass to Ander Herrera. The Spanish midfielder returned the favour, picking out the run of Martial perfectly and sliding through a pass for the striker to collect, take a touch and beat Tom Heaton from six yards. It was the 21-year-old’s 25th goal for the Premier League side and activates an incentive clause which means United must pay Monaco that additional 10 million euros. United’s important second goal, after 39 minutes, was far more scrappy but, potentially, vital for the fates of both clubs this season. Martial was again pivotal as he gathered a clever pass from Paul Pogba and darted towards goal, producing a shot which Heaton did an unconvincing job of blocking. The ball broke to Rooney, who responded more quickly than his marker Michael Keane inside the six-yard area and forced the ball over the line off the defender, despite the efforts of Stephen Ward to clear. 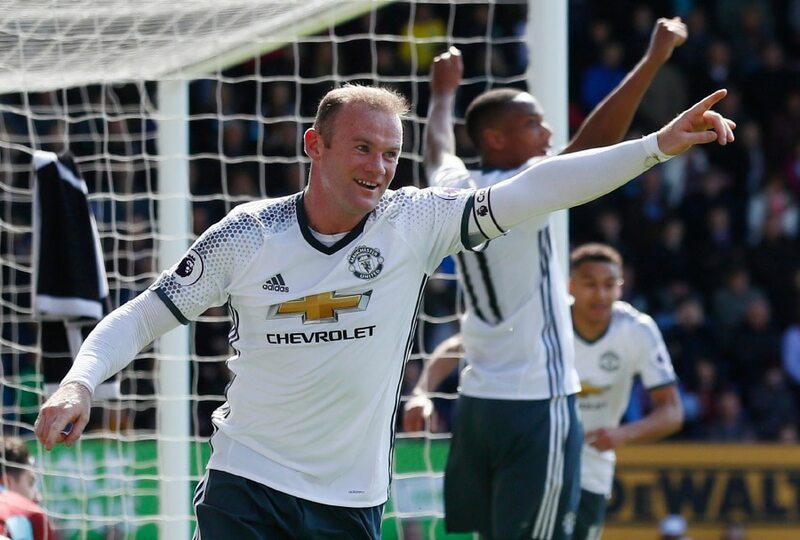 It was only Rooney’s third league goal of a season that had threatened to end with the club’s all-time leading scorer playing only a bit part in proceedings. But the injury to Ibrahimovic, who damaged his knee ligaments in Thursday’s Europa League win over Anderlecht, and Mourinho’s desire to rest Marcus Rashford ahead of Thursday’s derby brought him and Martial recalls. The pair combined early, with the help of Herrera, for a promising Rooney shot which was well blocked by Ben Mee. A powerful Marouane Fellaini header from a corner was held by Heaton on his line and Rooney side-footed a shot just over from a Jesse Lingard pass. Burnley, searching for a much-needed victory in their bid to remove lingering fears of relegation, offered little first half threat with Mee’s wayward header, from Robbie Brady’s corner, their only real threat. Burnley’s sloppy performance continued in the second half with too many unforced errors and misplaced passes preventing them finding a quick way back into the contest. Indeed, it took Heaton to keep his team even vaguely in contention as he scurried to his left and kept out a low shot from Pogba which seemed to be destined for the corner. When Burnley did enjoy a rare United error, with Andre Gray getting the better of Daley Blind on the right, his cross was cut out well by the impressive Eric Bailly. Rashford was brought on as a substitute midway through the second half and gave Burnley’s defence more to occupy them. Last hopes of any sort of recovery from the home side disappeared on 78 minutes when Keane arrived to meet a free-kick from Brady but could only head over the crossbar.